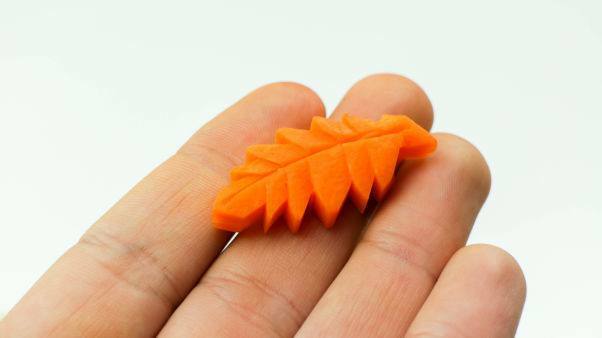 Great looking garnish makes your sushi or sashimi dish look even better. 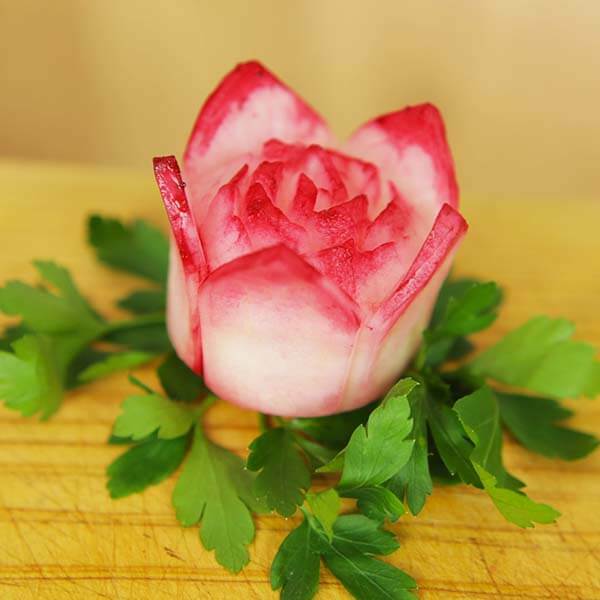 Step-by-step, Chef Devaux shows you how to transform vegetables into beautiful flowers or graceful animals. 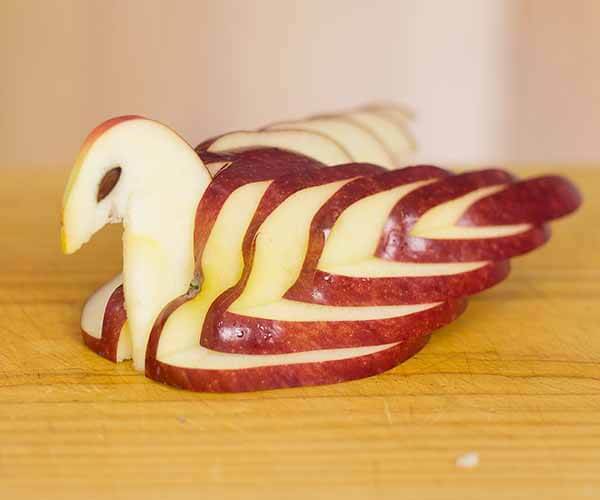 Learn how to transform an apple into a swan, a carrot into a butterfly or a daikon into a beautiful rose. This will enable you to put real showstoppers on your dinner table! Before you start, keep in mind that it takes practice, precision, a steady hand and a really sharp knife to transform vegetables into beautiful garnish. Chef Devaux shows and explains how it’s done. But don’t be disappointed if you don’t get it right the first time. In general, vegetables are quite cheap. So, buy some extra veggies for practicing if you haven’t done this before. It takes effort, but the result will make it all worthwhile. Click on All in the top menu, select a garnish to your liking and acquire the ingredient(s) and utensils. In most cases you don’t need much more than a sharp knife and a wooden cutting board. Then follow the instructions, watch the video to see how it’s done and start cutting. You can also start by selecting an ingredient from the top menu. You will then see various garnish tutorials based on the ingredient you selected. Click on the photo to go straight to the tutorial and start cutting! Choose from apple, carrot, cucumber, daikon, pickled ginger or tomato. 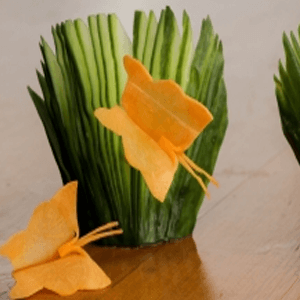 Transform the apple into a swan, change the carrot into a leaf or a butterfly, make a whale from a cucumber, a rose from the daikon, flowers from pickled ginger or wasabi. All garnishes are based on vegetables or fruit, so they’re absolutely also suitable for vegans and vegetarians. Please note: Chef Devaux does recommend using organic products for your garnish. Especially when the peel or skin stays on the fruit or vegetable, organic is the better choice. If you’re using the non-organic variety, make sure to wash the vegetable or fruit before you start cutting. That will help you get rid of any leftover pesticides or other unwanted chemicals. Last but not least: be creative! The creations of Chef Devaux are also meant to inspire you. Try to do the same with a different kind of vegetable. Or use the same vegetable in a different color. Apples come in a variety of colors, the same goes for carrots. Try for instance white, yellow, red or purple carrots, instead of orange. Or mix two colors together. Once you’re experienced, go to the next level and use the techniques to make your own favorite flower, animal or whichever shape you like. Be sure to send pictures of your own creations to Chef Devaux. He loves sharing your work on social media. Success and enjoy your meal!